Planetary conquest is coming to CCP Games' MMOFPS DUST 514 later this year, allowing players to shoot one another over tangible benefits. A new blog post recently added to the official DUST 514 website focuses on the upcoming addition of planetary conquest to the game. Currently slated for release "later this year," the new feature is said to provide players with more immediate reasons to kill each other. Specifically, cold hard cash (and other resources). "In an update arriving later this year, we will allow the planets -- or rather the many districts on each planet -- to be conquered by DUST 514 player corporations. Controlling these districts will amass wealth for you and your allies and provoke conflict with your enemies," writes CCP Games engineer "CCP Nullarbor." To allow for this sort of geographical macro-scale conflict, CCP will be dividing planets into districts. 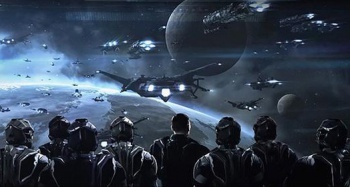 Each planet will feature between 5 and 24 districts and to help players navigate these new expanses, CCP claims that it has completely overhauled the in-game starmap with special attention being paid to optimizations for the PlayStation 3. PC gamers probably need not worry that the game will be watered down however. CCP built its fortune on the PC and has always been a staunch supporter of the platform. So how does one conquer a planet? Simple: You throw bodies at your opponents until one of you runs out of soldiers capable of squeezing a trigger. As with CCP's MMO EVE Online, the concept of characters respawning is explained by in-game lore as the activation of a clone body. Taking control of a planet's districts will allow players to generate more clones, thus improving their ability to rapidly deploy troops into other areas. You can see why capturing and holding these districts would be crucial. If this sounds like a recipe for chaos, there's good news: CCP has designed the system in such a way as to provide players with periods of down time. "Each district replenishes its clone supply at a pre-configured time chosen by the owner," Nullarbor writes. "However, this also makes the district vulnerable to attack for an hour each day. Battles are always scheduled during this window, meaning you won't need mercs to be geared up and ready to deploy 24/7, and both sides get a day or so to prepare for the onslaught to come." Once you've taken a district, instead of simply letting it remain as it was before you took control, you're able to upgrade the area with various installations that improve the speed at which your side can generate clones, the district's ability to store surplus clones and how rapidly these clones can be deployed. That's neat, but we haven't mentioned the best part yet: Orbital bombardment. Say you get tired of sprinting around, staring down the sights of your gun and shooting at other players. Instead of turning the game off you can instead use the interconnectivity between DUST 514 and EVE Online to take the battle into space. Players will be able to fire on districts from orbit, using a variety of weaponry, though you should be warned that friendly fire is entirely possible. Aim your bombs carefully or you might vaporize a bunch of those hard-earned clone soldiers. As we mentioned above, there's no set release date for this content, other than the nebulous "later this year." Expect more information as it emerges.